rod pocket valances that you can purchase at any home store. If you are making a cornice board, you would follow the same directions you would need to construct the cornice. Then, before you make the seam that will attach the front fabric to the lining, you will want to cut the beaded fringe in the length of the board. Pin the beaded fringe (upside down, so that the beads are facing the top of the cornice fabric) along the front bottom edge of the fabric that is going to cover the front of the board. When you make the seam to attach the front to the back lining of the board, the ribbon part of the beaded fringe will be inside the seam. When you turn your seam right-side out, the beads should fall from the seam and the ribbon shouldn't show. Cover the cornice board in your fabric with beaded fringe attached. You can add beaded fringe to an existing cornice board fairly easily. There are two options, you could remove the bottom seam and continue on as the directions in Creating A New Cornice Board, or you can apply the fringe to the board without deconstructing it at all. First, remove the cornice board from the wall. Then cut the beaded fringe the length required to go from one end of the cornice board to the other, plus 1" to fold over at the ends. You can either glue the ribbon to the inside lining (making sure that the ribbon doesn't show from the front) or you can pin the beaded fringe in place and hand stitch the ribbon to the lining. 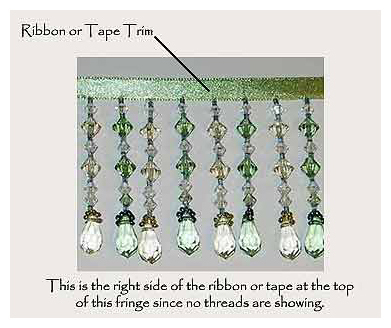 At the end of the valance, fold the ribbon's cut edge so that it is tucked between the fabric and the ribbon on the beaded fringe and pin into place. If you want to cover the ribbon of the beaded fringe so that it doesn't show against the inside lining of the cornice, you can cover the ribbon part with decorative trim or gimp.